Der M4A1 Revalorisé ist ein französicher premium mittlerer Panzer der Stufe 8. In den 1950ern wurden verschiedene Ausführungen des M4 Sherman als Teil des MDAP an Frankreich exportiert. Französische Konstruktionsbüros beginnen die Modernisierung des Fahrzeug mit dem Ziel, die Feuerkraft zu stärken. Diese Initiative war gefolgt von einem Modernisierungsprogramm der IDF (Sherman M51). Der Panzer wurde von Frankreich nie eingesetzt. Wie viele Prototypen gebaut wurden, ist unbekannt. Default ammo is APCR, giving high shell velocity, expect some bounces however. Decent accuracy when fully aimed. Good view range, especially with binoc. Best alpha damage (along with the T-34-3) of all Tier 8 premium medium tanks. 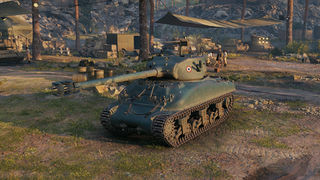 Cheapest Tier 8 premium tank (same as T26E4 SuperPershing). Tall silhouette (prone to hull flipping) with no armor and pretty low camo values. Long reload speed and aim time. Average gun depression, not bad but not good either. Very weak ammo rack and frontal transmission. 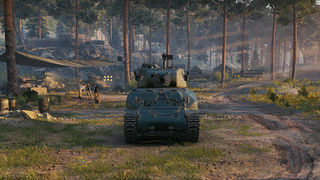 Dubbed the "Super Sherman", this tank plays more like a sniper than anything else, just like the Firefly, but with a longer aim time and reload speed, and much higher damage per shot. The very long reload and lack of armor makes brawling more or less impossible, unless when supporting allies and taking potshots at already distracted enemies. Although this tank has a long reload and aim time, the good accuracy and damage coupled with the high APCR shell velocity make this tank an excellent sniper. This tank should be in the rear guard, making use of terrain and allies to cover the large hull as well as making smart use of terrain since gun depression of this tank is quite bad. Make sure you fully aim your shots before firing, as this gun will punish you by missing and let you face a long reload. 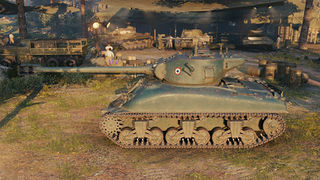 The M4A1 Revalorisé was a French project to up gun the M4 Sherman. Eventually this led to The Sherman M-50 and the Sherman M-51, both known abroad as the Super Sherman that served with the Israel Defense Forces from the mid-1950s to early 1980s taking after the French Revalorisé. The M-51 was also referred to as the Isherman (i.e. 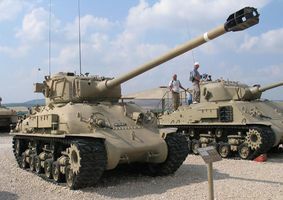 Israeli Sherman). However, the designations "Super Sherman" and "Isherman" were never used by the Israeli Defense Forces. The tank never served in combat for France and the number of vehicles created is unknown. Diese Seite wurde zuletzt am 27. März 2017 um 11:06 Uhr geändert.